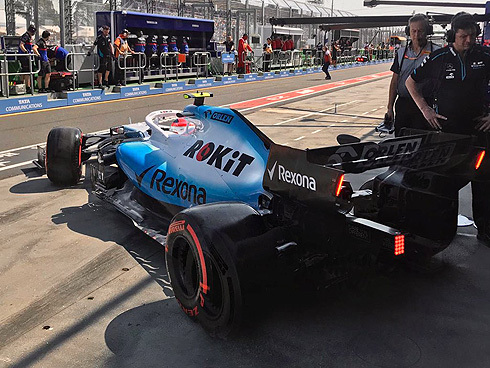 Qualifing for the 2019 Australian GP would be a continuation of the earlier practice sessions for the ROKiT Williams racing team. 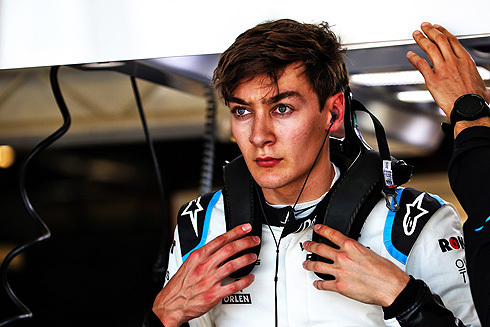 George Russell would finish ahead of Robert Kubica but the pair were still slowest being 19th and 20th. The session would see George improve on his three runs on the soft tyre in the opening period but it was not as easy for Robert. Robert would make contact with the wall puncturing his right rear wheel seeing his last run ending up with him taking to the grass on the way to his pit with a flat tyre. Both drivers were inside the 107% rule so will start Sunday's race. 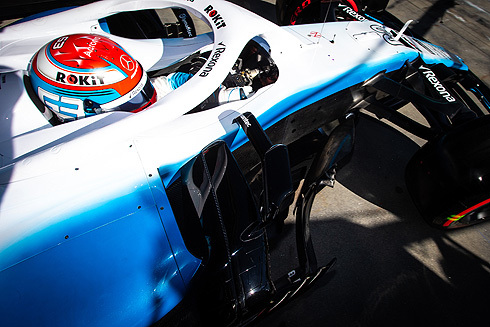 With the start of qualifying both Williams drivers were out on the soft tyre in the opening eighteen period. Norris would go quickest with a 1m:24.654 followed by both Williams but they were a big gap behind. The Williams pair would rop down the times as others came out for their runs. Both Williams cars would come out for a second run. Quickest now was Bottas, 1m:22.658, followed by Hamilton and Vettel but Vettel was on the medium tyre. Hamilton would now be quickest with a 1m:22.043 moving ahead of Bottas and now Verstappen. Both Williams drivers would pit and come back out for a third run again on the soft tyre. The period would end with the Williams drivers slowest and replays had shown Robert making contact with the wall with his right rear tyre. This would puncture his tyre seeing him take to the grass. End of the period would see Leclerc fastest from Hamilton. The second period would see Hamilton go fastest with a 1m:21.014 followed by Bottas, Verstappen, Leclerc, Grosjean, Vettel, Magnussen, Raikkonen, Norris, and Perez. Both Renault's would fail to make it through joined by both Toro Rosso's. The final period would see Hamilton taking pole with a 1m:20.486 followed by Bottas, Vettel, Verstappen, Leclerc, Grosjean, Magnussen, Norris, Raikkonen, and Perez. Robert would be out first for qualifying coming out on the soft tyre. A 1m:26.728 on his first run. Robert would pit after his first run. Quickly he would return for a second run. He would improve with a 1m:26.067 remaining slowest. Another pit stop for Robert most likely seeing him end his qualifying. But now he would return for another run. But he would not improve ending his period. He had hit the wall going through a left hand corner puncturing his right rear wheel and seeing him take to the grass as he made his way back to the pits. George will follow his team-mate out also on the soft tyre. George would move ahead of his team-mate with a 1m:25.728. George would also pit after his first run. George would also find a small improvement with a 1m:24.993 to remain in front of his team-mate. George would also pit ending his session. George would also come back out and would set a 1m:24.360 to be still ahead of his team-mate. In a post session interview George would say: "I enjoyed it ... we know the pace of the car and I have drive the package as fast as we can.... I felt the three laps I put together as the most I could hope for. ... I am not interested in besting Robert for the last position. ... This is where we are going to be for a couple of races to come."